This summer, I completed an internship at a bank in Kuala Lumpur, Malaysia. I’ve worked in Malaysia before, but this was my first ever experience of corporate life back home. Having done insight days in London, I suppose I can only really compare my experience in Malaysia to my experiences in my other home, London. Getting around in KL is easy – people drive or get an Uber/taxi. It’s one of the cheapest, fastest and safest ways to get around, and I’ve rarely had to resort to using KL’s notoriously terrible public transport system. In a last ditch attempt to avoid the Friday evening traffic jam, I jumped onto the KTM Komuter train. There is no Citymapper, no online website with a clear map, and I had to spend my last half an hour at the office trying to find a schedule and to figure out which lines and platforms I was meant to get on. Surprisingly, the train was only 12 minutes late. Don’t even get me started on public transport decorum – in Malaysia, both the right and left side of the escalator is for standing, walking, or weaving through. People do not wait for people to leave the train before getting on, so to ensure a spot on the train your best bet is to follow the crowd and push against those trying to get out. On the bright side, my journey on the Komuter train only cos me RM1.30 (around 20p). When I moved to London three years ago, one of the biggest forms of culture shock I got was the invasion of my personal space. In Malaysia, supermarket cashiers would never ask you how your day was, no one would just make conversation on the street, and you’d be hard pressed to find someone to chat about the weather to on public transport. Everyone in KL much prefers keeping to themselves and I actually kind of started to miss excessive British politeness. Life in the UK revolves around the pub. If you’re not already at one, chances are you’re on your way to one or passing the time at work until it’s socially acceptable for you to be at one. In London, drinking culture is strong – you get closer to your colleagues with nights out and post-work drinks. Being a Muslim country, drinking isn’t as common in Malaysia. At the end of a long working day, we Malaysians love to lepak, which loosely translates to chilling out. On any given day you are likely to find groups of people hanging out through the early hours of the morning over a pipe of shisha or watching a late-night football game at their local mamak stalls. I was fortunate enough to work in at an office with two cafeterias: one was air conditioned and indoors, and boasted Western classics like spaghetti or chicken. The other was outdoors and gave us the option of around 10 stalls to choose from. 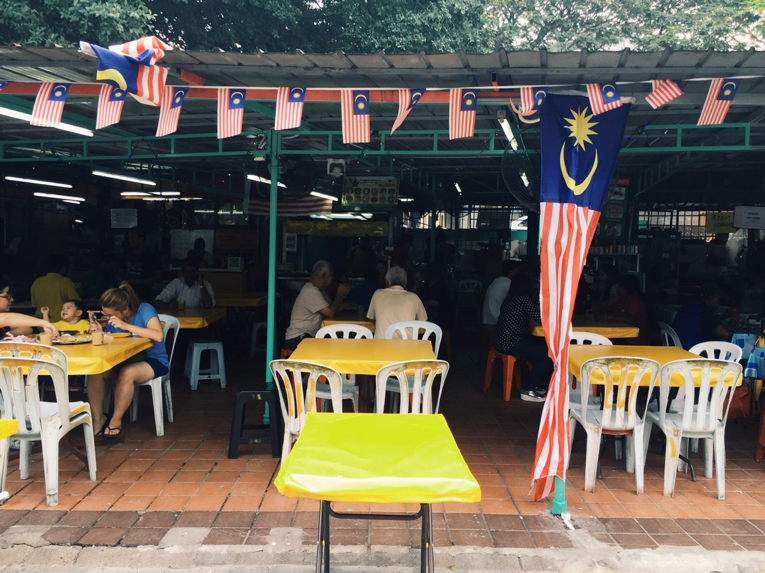 As Malaysia is made up of three main races, the Malays, Chinese, and Indians, every lunch was completely different from the last. Much better than those cold egg and mayo sandwiches I think. If you want a rule to be followed in Malaysia, the last thing you would probably do is put a sign up. The Komuter trains have women’s only coaches at the back, giving women a safe space to avoid sexual harassment. Inefficient signage and a lack of enforcement mean that these coaches are no different to the regular ones. Plus, on my induction day at work, I was told that official lunch hours were from 1pm to 2pm, but you could really just go at 12:30 and come back past 2. On Fridays, there’s even more flexibility and I’ve seen people come back into the office at around 3pm. Malaysia’s “no rules” culture brings me to my next point – driving in KL. Malaysian drivers do whatever they want. It doesn’t just stop at running red lights or parking on main roads. It’s a normal occurrence to find people driving on the wrong side of the road, making U-turns where they aren’t meant to and cars tripled parked on busy streets. Whenever I’m in London, I’m in awe of how a double yellow means a double yellow, and how everyone follows simple road rules. Like I said to Imogen during her weekend visit, I’m not a great driver, but I’m a great Malaysian driver. Malaysia has 15 public holidays every year and ranks as the fifth country with the most public holidays. The UK, on the other hand, only has six permanent bank holidays and two public holidays. I worked at the bank for only a month and celebrated TEN office parties. In the UK, the Licensing Act 2003 came into force and legally required all restaurants to serve its customers tap water for free. In Malaysia, it is against the law for restaurants to serve tap water, due to high levels of contamination.